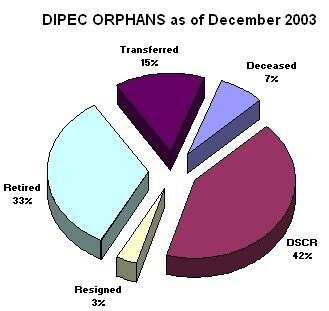 DIPEC "Orphans" refers to those who left Memphis to come to the Defense General Supply Center beginning in 1992. The first group totaled 50. I was the last one to move in late 1994, at which time only about 20 remained. I have not regretted moving to Virginia. I had always considered some sort of mid-career move, I just expected to choose where. Updated January 2004. No guarantee as to accuracy. Send feedback to Dave Meier. Julia Ann Brandon Transferred to Mechanicsburg, PA as DLA Rep.
Joe Davenport DSCR Supervisor of Supply Customer Requirements. Fred Green DSCR Supply Reparable Inventory. Don Harris Transferred to Columbus,Oh. John Hoyler DSCR Customer Requirement. David Jarrard DSCR Supervisor of Technical Commodity Section. Allen Johnson Retired March 1999 - remained in VA.
Gladys Smith DSCR Supply Reparable Inventory. Joe Tucci DSCR Supply Customer Requirements. Don Ward DCSR Supervisor Supply Product Scheduling - wife Kathy works here also.